Hunter Quick Check System – George Stock and Company Ltd.
Hunter’s Quick Check® is your one-stop vehicle inspection system. These fast, easy-to-use inspection systems can complete a full, comprehensive vehicle inspection in under two minutes. 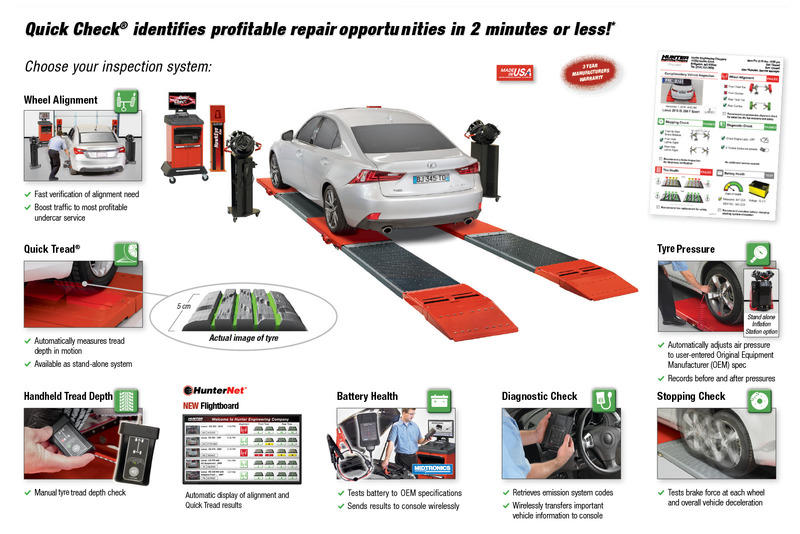 The Quick Check® system gathers valuable information about a vehicle’s alignment, brake performance, battery health, diagnostic codes, tire health and more, allowing shops to check every car, opening the door to new revenue opportunities while improving customer retention. Hunter’s vehicle inspection system is available in multiple configurations to suit your shop. Quick Check® truly is the must-have vehicle inspection system for your shop. Learn more about Hunter’s industry-leading vehicle inspection systems today.